Nonetheless, we have started a new calmer, gentler mommy administration here. Some rules are still in strong effect—no pulling, kicking and biting. The rest we are trying to let slide. All that discipline sometimes gets in the way of being with your child. Put in roughly chopped greens (about 1 bunch each), sautee until just wilted. Cook homemade cavatelli for 3 minutes. Fish out of the water and add to the veggies. Sautee, add a little pasta water, and then cover. Finish with olive oil, red pepper and thinly sliced red onions. This post is part of @lornayee from The Cookbook Chronicle's #meatlessweek ; and I decided to join in because I heard about it from @celiacteen . Go enjoy their posts as well as the others lettign the pigs off the hook this week. And, for fun, I thought I would send this over to Presto Pasta Night started by Ruth of 4 Every Kitchen and hosted this week by Rachel The Crispy Cook. Dish looks great. . .the shelling, the shelling though! LOL re your reputation: I wonder what she tells her friends! Mommies somehow always get the rep for being the mean parents while daddies get to be fun. Why is that? 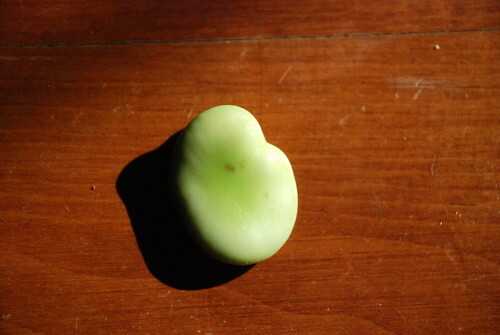 This looks like one fabulously green pasta. All the better because you got to spend quality time together while creating it! 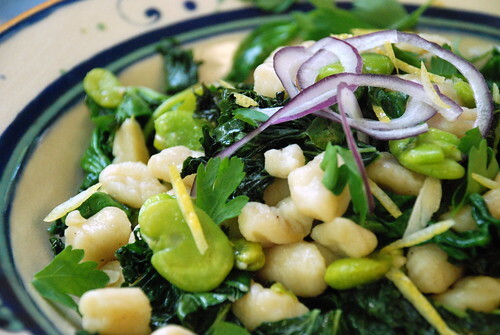 Fava beans with kale and dandelion greens sounds delicious as well. 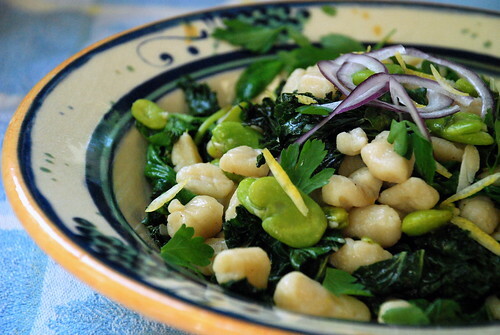 What lovely photos and such a great spring pasta dish. Thank you for sending this over to this week's edition of Presto Pasta Nights! 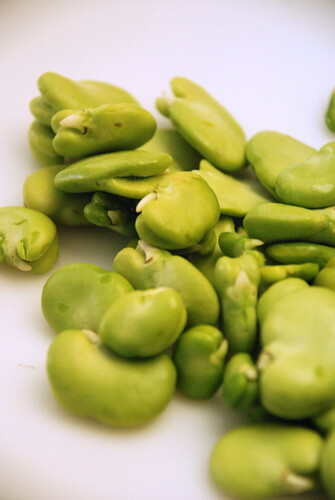 Your pasta looks simple and delicious, which is exactly the right way to treat those lovely favas. 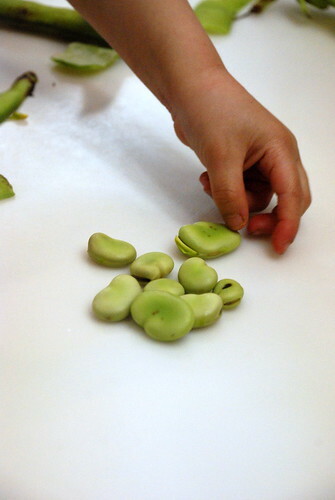 And funny, I had a very similar experience with my munchkin, shelling fresh garbanzos. At first I thought they were all going to get eaten before we had any dinner, but then there was knuckling down and surprising helpfulness! Joy! In France, we call that Gnocchis. I already made two recipes, 1 with Potatoes, the other with Brocoli. But both time, I could make those thin stripes on it. I have just understood how it does work when I saw your picture.! all my favorite things in one dish.